Nika is a 3rd-year middle-school student with social anxiety. One day she drops her eraser in class, and slacker Akira picks it up. After school, Nika follows Akira to an ice rink in pursuit of her eraser. There, she discovers Akira’s beautiful figure skating and her own love of the ice. 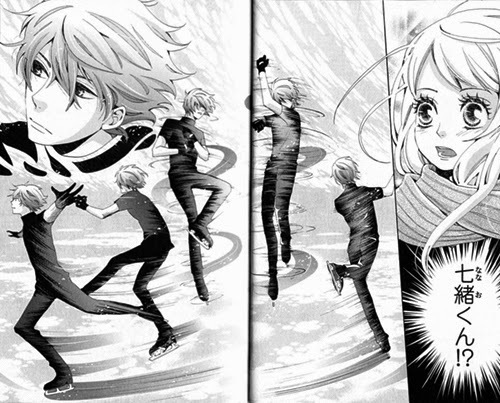 Alternatively, Kiwako is a brash young champion ice skater and Akira’s childhood friend. 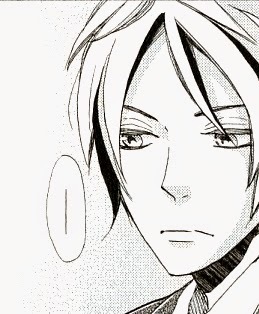 Akira tells Kiwako that one day Nika will become her rival. Which genius ice skater will become The Ice Queen? Oh, the cover is so pretty and it’s about ice skating! Uh-oh! Another timid shoujo heroine. Oh, but she’s cute and she doesn’t hate herself. She just has a hard time finding the words to say and speaking up. I can relate. Artwork B+: The cover initially attracted me to his title. I like the flaming red hair and the movement of the main characters in the illustration. In the comic, the skating sequences are very dynamic and give a sense of speed and whirling motion. I also like the clothing in this series too. The glaring problem with artwork is that the two male characters have very similar faces. I was only able to tell which was which because of the hair styles. That same could probably be said for the female characters’ faces, but the hair style are so drastically different that the weakness is hidden. oujo tankoubon. It has a nice color dust cover, but there are no color pages. I didn’t have any problems with the text being too small and the mangaka’s handwriting is legible. Story A: I didn’t have any expectations going into this series. Bessatsu Friend series are strictly junior and senior-high-school love trains, so I prepared myself for the inevitable love polygon. What I got was a first volume that was mainly focused to two very different shoujo heroine’s love of ice skating. That’s not to say there wasn’t any romance involved, it’s just that it wasn’t the focus of the story. The story flow is a bit unusual. The first two chapters are devoted to Nika, a 3rd year middle school student who happens to discover that she’s an ice skating prodigy. The second two chapter are devoted to Miwako, a veteran hard-working figure skating genius who’s also a national champion. The two main characters are polar opposites, and the story seems to be setting them up as future rivals for the rest of the story. The story pacing is good and is helped along by the dynamic illustrations. I love the sensory descriptions of ice skating when the story focuses on Nika. It really gives the reader the sense of being on the ice with her. The story telling is bit different with Kiwako because most of her narration is her inner monologue as she struggles with self-confidence. This is kind of amazing for shoujo, and I wonder if at some point the stories of both girls will meld. Needless to say, I was swept away into the world of both girls’ stories. Readability: On the easy side of Medium — There are furigana to help with the kanji and the vocabulary isn’t very challenging, but there is a lot of dialog, so it does take some time to read through. It’s not as easy as “Let’s Dance a Waltz”, but the broad strokes can be understood with intermediate Japanese skills. 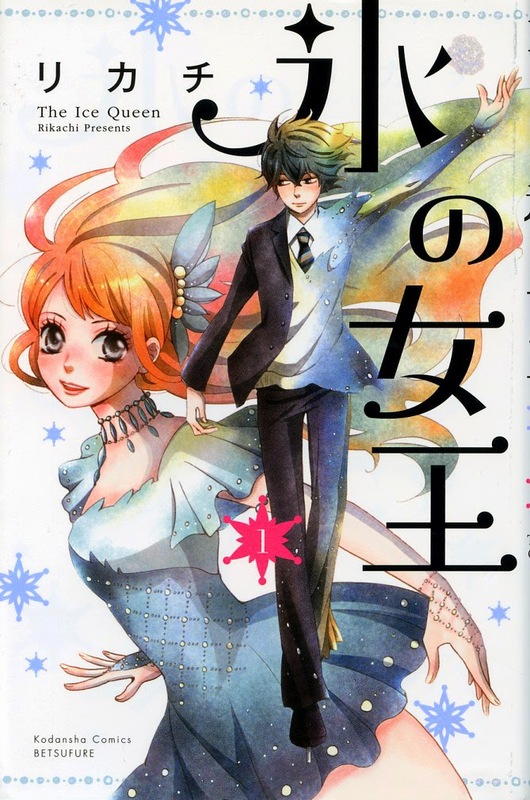 Overall A-: Really the only dings for this first volume of “The Ice Queen” are the same-face syndrome that afflicts the male characters and the lack of color pages, otherwise this is top-notch shoujo for readers of all age. I highly recommend “The Ice Queen” to Japanese language readers and I think it would be a good title to license in the US. For Japanese language readers in the US, Amazon US does sell volume 1. Awesome! I so wanted to know more about this series. I’m going to have to check it out for myself. I’m a sucker for ice skating so I’m sure this is a series I will love. Thanks for the review!